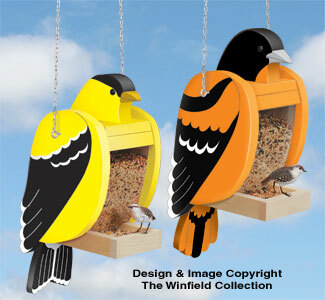 These brightly colored feeders will make an eye-catching addition to your yard while feeding your feathered friends. Features include easy-fill hinged head, clear acrylic belly and tray bottom for viewing seed levels and and simple construction. Fun projects to make from our full-size patterns. 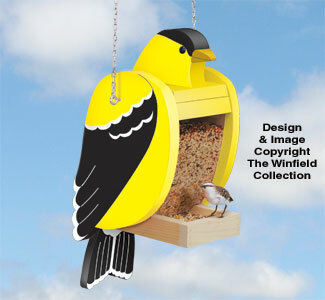 This brightly colored Goldfinch-shaped feeder will make an eye-catching addition to your yard while feeding your feathered friends. 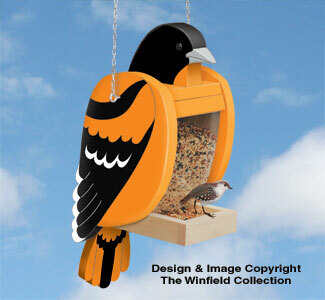 This brightly colored Baltimore Oriole-shaped feeder will make an eye-catching addition to your yard while feeding your feathered friends.